I love tea. I mean I really really love it. I remember coming home from school on days when that history test got me down, or I wore the same outfit as someone else or some other silly thing, and everything would be immediately resolved with a piping hot cup of Earl Gray tea with honey and cream. It was delicious. I think that half of my infatuation with London came from the fact that I envisioned them to drink tea all day long (the other half came from obsessive reading of A Little Princess when I was little). When I lived in London I decided to uphold my image of Londoners and drank tea constantly- I recall even coming home from evenings out and making myself a lovely cup of tea. Today, I still love tea, though I find that I often drink coffee instead. 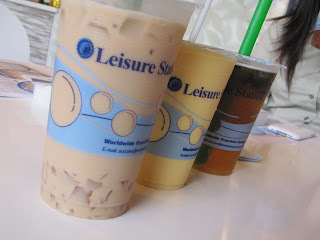 Yesterday however I had the chance to meet with the owners of Leisure Station, a relaxed, tea based restaurant in Kendall Square and I rekindled my love affair with the drink. The story behind Leisure Station is a fascinating one as the parent company, Easy Way, opened their first doors in 1992 in Taiwan. The shops have been incredibly successful, and have begun to franchise, opening just three, adopting the name Leisure Station, in the US. The initial two stores are located on the West Coast, but the third opened just two months ago in our own Cambridge. Leisure Station specializes in unique tea drinks, incorporating both hot and cold, as well as blended ice drinks and smoothies. One of the great parts of their offering is that you are able to customize anything you want. Since my high school days I have cut out adding sugar/honey to my tea, and definitely no more cream, so I was glad to hear that though they have a standard way of making their teas, they are more than happy to offer sugar free, dairy free, sugar alternative, and dairy alternative additives. The also offer a number of "toppings" that can be added to your drink for unique twists. 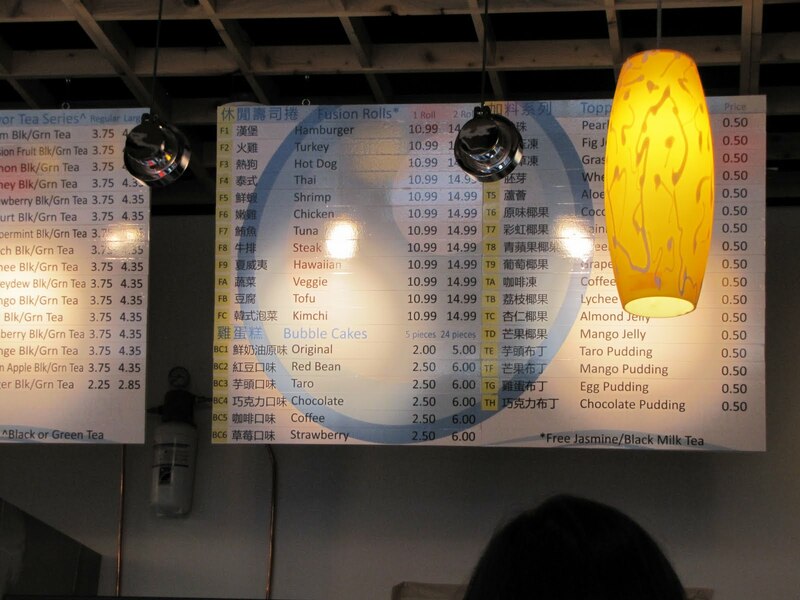 The most popular are the tapioca balls often seen in "bubble teas", however Leisure Station doesn't stop there. You can also opt to have any number of jelly's added (think fig jelly, coconut jelly, lychee jelly or even grass jelly) for a unique flavor twist. If jelly isn't your thing, they can sub in some pudding as well. However Leisure Station doesn't just offer Tea, they also have a line of food products that are uniquely fusion by design. Fashioned after sushi rolls, patrons can purchase "rolls" filled with stereotypical "American" ingredients such as a hamburger, or a hot dog. They are also making these rolls with more "traditional" ingredients such as tuna and shrimp though they assure us that all of their ingredients are fully cooked. Next week, they informed us, they will be rolling out bubble cakes, which are, though I haven't had the pleasure to try them, apparently lovely little cakes, shaped like eggs and filled with an assortment of puddings such as chocolate, taro or red bean. I got to try a black tea-which I asked for them to make in the standard format so I could try the "real deal" with the addition of fig jelly, additionally I was able to sample the coconut jelly, the grass jelly, the egg pudding and pieces of both the shrimp roll and the tuna roll. The tea was delicious- though much sweeter than I am used to, but had delicious flavor under the cream and the sugar addition. Unfortunately, the fig flavor did get a bit lost, I have to wonder if perhaps I just had straight black tea with the fig jelly if it wouldn't be a stronger flavor? 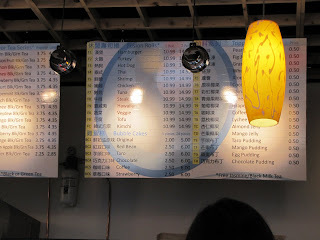 The other jelly's tried were very delicate in their flavors as well, as was the egg pudding. The delicateness of it was actually quite perfect- I was concerned that the flavor of the jelly might overpower the lovely tea, but really it just gave background hints of alternate flavors. The rolls were enormous! I have honestly never seen a sushi roll so large, and I have to admit I was terribly unladylike eating it. 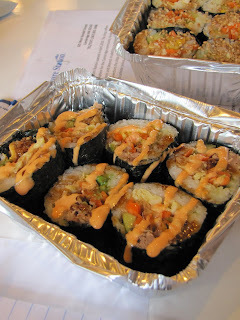 The flavors however really did make up for the size as both rolls were chock full of fresh vegetables, nicely cooked seafood, and wonderful seasonings. What I really enjoyed about Leisure Cafe is that everything is made to order. This is a wonderful point for two reasons, the first being that nothing is sitting out and getting into odd "mushy" states, the second is that if you don't want a certain ingredient in your item- they will just extract it...or you can add in ingredients. Customization is definitely key-sometimes just want to add some carrots and corn to your hot dog roll! Finally, it must be mentioned, that Leisure Station has one of the most impressive technical systems I've seen within a restaurant. At the forefront of this is the franchise owners own creation of texting your order in as opposed to calling or ordering on line. What could be easier? You're on the go, you want a tasty cup of tea and an imaginative fusion roll- just pull out your phone and it'll be ready for you! I was incredibly impressed with this idea and hope that more spots start to follow the trend. Also -in this little tea shop- they are set to go for Karaoke anytime you want...after 7 pm. So if you feel the need to sing a little tune, or belt one out at the top of your lungs this is the place to go! Man, you are FAST! I haven't even posted my Melting Pot post . . . heh heh . . next week, for sure! Those are giant sushi rolls! I also never would have thought of mixing jelly with tea so that's interesting. Fantastic pictures by the way! Sometimes at events its hard to get good shots and yours are beautiful! I was hoping to be able to attend this event on Wednesday but had too many deadlines! Hope to see you again soon! Thanks for the review. It is nice to see another Bobo Tea shop opened up near my work place. However, I don't think they are the first one who offered the rice roll. Blue Asia Cafe, opened 6 months ago, located at 113 Brighton Ave, Allston, MA, has a large selection of the giant rice roll creations. One of their rice roll has hot dog too.